New lines of mobile electronic products are being introduced with the addition of a feature slot for expansion programs and memory. One popular format is the SD (Secure Digital standard) which has just been introduced by Palm in their exciting recent introductions. Additional products such as cell phones will soon follow. 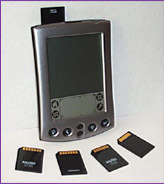 MacroPort produces Content Cards that meet the industry standard MultiMediaCard format. This standard works with the SD form factor to allow low cost memory expansion for these new feature slots. You can store your applications like: games, encyclopedia, maps, books, restaurant listings, and much more. These Cards are approximately the size of a postage stamp with the thickness of a credit card. Are you a developer for the Palm Plugged-In program? Are you looking for a platform to develop your products on? You have come to the right place. We offer Content Cards in different densities to accommodate different code sizes for your various applications. The Content Cards range from 2 MBytes to 64 MBytes with some impressive benefits shown below. 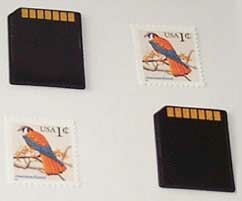 For reference, an 8Mbyte Content Card can store up to 2,000 pages of material. Are you a member of the Palm Plugged In Program?